AUTHENTIC CONVERSION DEMANDS A NEW LIFE IN CHRIST. Conversion supposes living a new life, that of Christ. “Go, sin no more.”: Conversion supposes daily struggle to overcome sin, for love of God and those people beside us. Our Lenten journey is about to reach its end. As we approach the Holy Week, the last Lenten Sunday liturgy, the 5th Sunday of Lent, proclaims the positive and sanctifying end of the true Paschal renewal and of the genuine Christian reconciliation with God. 1. Conversion supposes living a new life, that of Christ. This conversion does not only lead us to a true repentance for our sinful life and hatred towards sin. Christian conversion is not a mere religious purification from sin as in other religions, but rather, points to a new life in Christ, a real transformation of our life and identifying ourselves with Him for Love. CHRISTIAN PASCH OR EASTER DOES NOT ONLY IMPLY GIVING DEATH TO SIN AND TO THE OLD MAN IN US. IT IS ESSENTIALLY A TRUE RESURRECTION IN CHRIST TO LIVE A NEW LIFE —CHRIST’S LIFE: HOLINESS —WHICH IS POSSIBLE IF WE STRIVE IN HIM, WITH HIM AND FOR HIM. This newness in life is the underlying idea which today’s readings wish to transmit us. In the 1st reading (Isaiah 43:16-21) the prophet proclaims the liberation carried out by the Messiah, Our Lord Jesus Christ, to a new exodus, a new work carried out by God to give life to His people. In the 2nd reading (Phil 3:8-14), St. Paul states that what is essential is to strive to possess what really matters in this life: God. One must be detached from the things of this world giving them their due value, as means to reach the most important end of man: union with God through Christ in this life and the next. 3. “Go, sin no more.”: Conversion supposes daily struggle to overcome sin, for love of God and those people beside us. How great is God’s tenderness, benignity and mercy towards sinners! The Lord condemned the sin but not the person, not the woman. We should imitate Jesus’ attitude: we should always show compassion to all who are sinners like us and not pass cruel judgments against them. Learn to separate the person and the evil action. Compassion and mercy towards the person and rejection of the evil action. Furthermore, Jesus is always willing to forgive us. However, He also expects from each one to put the means in order to live a new life: Go and from now on do not sin anymore! Dear friends, as we approach the Holy Week when we commemorate the Paschal Mystery of Our Lord Jesus — His Passion, Death and Resurrection — through which we have been saved, LET US SECOND OUR LORD’S WORDS IN TODAY’S GOSPEL: “GO AND SIN NO MORE”, THUS STRUGGLING DAILY FOR LOVE TO GIVE DEATH TO SIN AND TO THE “OLD MAN” IN US AND THUS TRULY RESURRECT AND LIVE A NEW LIFE IN CHRIST AND TO THE NEW LIFE OF HOLINESS TO WHICH HE HAS CALLED US. 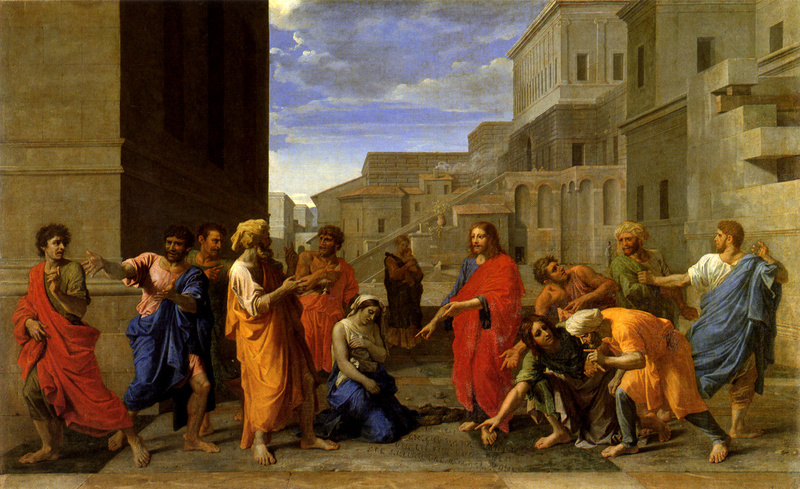 SEE AS WELL: 5TH SUNDAY OF LENT MASS PRAYERS AND READINGS. REST IN PEACE AND PRAY FOR US, Sisters Anselm, Marguerite, Judit and Reginette!